Place the shredded lettuce in a large, flat dish. Layer with cucumbers, green onions, green bell pepper, cauliflower, baby carrots, broccoli, and radishes. Pour drained beans over the vegetables. 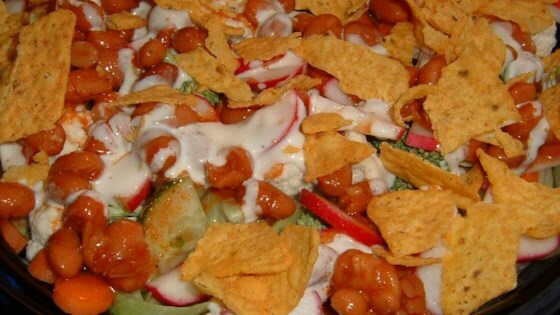 Cover with Ranch-style dressing, and top with nacho-flavor tortilla chips. Cover, and chill until serving. This recipe is absolutey wonderful! My girlfriend requests this recipe very often! HUGE salad. But quite good. Healthy with an interesting spin! Served this with a Southern Living lentil burrito recipe and Mexican Rice III from this website. Thanks for the recipe.